Wednesday morning our office played host to a crew of visitors from Oklahoma City’s KOCO Channel 5 News! We treated them to some espresso from our bi-weekly pop-up coffee shop and a tour around the office, which we often forget is a little more casual than your typical business. We’re all so honored and thankful that Maggie and the KOCO team would take some time out of their day to stop by and learn more about what we’re doing here at QuiBids, so I thought I’d return the favor in true QuiBids fashion by having a little fun with their report. 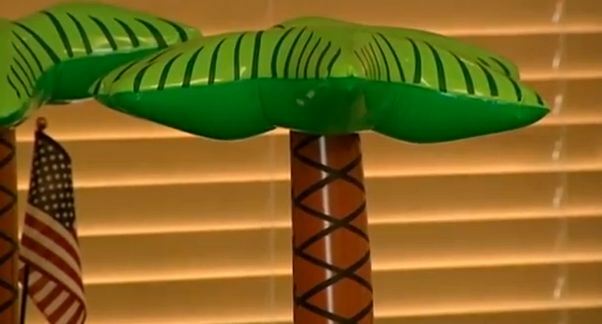 Here are six of the funniest things we keep in our office, as captured by Channel 5 news Oklahoma City. 1. Tributes to our favorite Thunder players! We can’t stress our love for the hometown NBA team enough. Our hopeful hearts broke when Kevin Durant’s crew couldn’t stand the Heat earlier this summer (seriously, it was like sad little storm clouds had gathered inside our office), but we gathered the pieces back together and are ready for another shot at the 2012 NBA season. 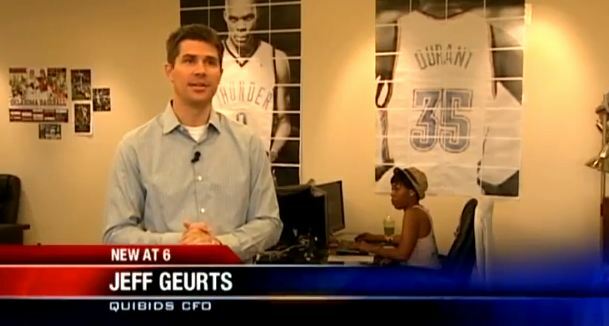 Channel 5 putting our CFO Jeff in front of our homemade Russell Westbrook and KD posters couldn’t have made us any happier. Being a dotcom business, we’ve obviously got a ton of tech and app enthusiasts on staff, and the bulk of them all work in our development offices. 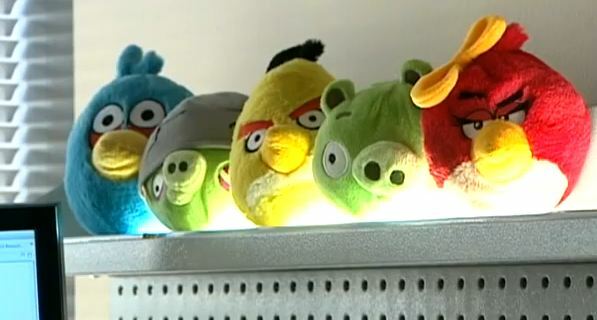 These plush Angry Birds come from the stand-up desk of Billy, one of our application developers! It’s hiding right behind Kerry, our VP of Business Develop and Merchandising, right there. We may or may not have timed races around the office at some point. 4. 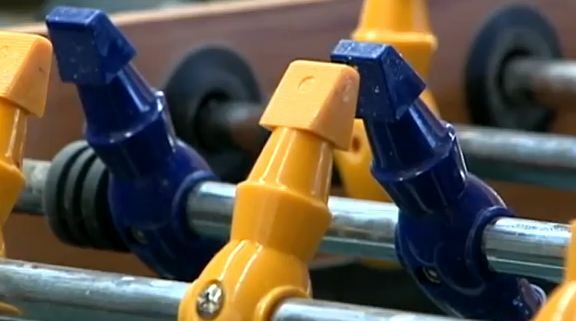 Our beloved foosball table! Ping pong is the more popular pastime around the office, but the foosball table’s settled its share of inter-office rivalry too. We’re glad to see it got the close-up treatment it deserved. Every two weeks we get a visit from Dirty Water Coffee Company, an Oklahoma –based pop-up coffee shop that sure makes a mean —uh— everything. I usually go for the Popeye, a spinach-and-fruit-based smoothie, but they sling hot and cold joe and espresso shots aplenty. What fun is it to work in an office building if you can’t liven it up a little bit? Our Compliance department has the most vibrantly decorated room in the entire tower, and goofy stuff like this really pulls it all together, so to speak. We also went ahead and transcribed the copy from the report below, if you’re more the reading type. Enjoy the weekend! An emerging online auction site is now working to draw new professionals to OKC. In three years, QuiBids has grown along with competition from other sites. KOCO’s Maggie Stokes looked at how the company is trying to get young graduates to choose their company over other web giants. All you have to do is walk into QuiBids, awarded one of the best places to work in Oklahoma two years running, and it’s clear why: Employees sporting Thunder hats, tennis shoes, jeans — so progressive! And that’s exactly what CFO Jeff Geurts wants. “We are hopeful that other technology companies will pop up here and that we are blazing a trail, showing that an internet company can thrive in Oklahoma City,” said Geurts. To thrive means competing with internet giants like Google and Amazon. In fact, Amazon is where QuiBids found Kerry Morris. “I really got a bug for being a part of building and developing new business models, and that’s what attracted me to QuiBids,” said Morris. And the perks help. A foosball table, ping pong, and toys scatter the offices so that their employees can tap into their creativity. So it turns out we came on the right day. Every other Wednesday it’s a latte, maybe a smoothie you’d like. Every other Friday, massages. And these are just a few of the perks that they have here at QuiBids. QuiBids attracts graduates from universities all across the state and nation-wide. And as you can imagine, it’s not hard to find new hires like Alyse Cox, who joined the company a month ago. “I think everyone wished that they could work in an environment like this,” Cox said. QuiBids workers also volunteer with many local charities in Oklahoma City. Last month they gave iPads to some of the patients at OU Children’s Hospital just to brighten up their days.